Yesterday, the Federal Open Market Committee (FOMC) met to discuss current and future economic conditions. It was previously predicted that there would be two rate hikes in 2019, but after their meeting it was reported that the rate will remain unchanged and continue to hold at 2.25-2.5 percent throughout the year. Fed chairman, Jerome Powell, assures us that the economy is in a good place. However, growth is slowing due to recent developments abroad, which led the Fed to take a more dovish approach to rates. The dot plot released at the end of the meeting predicts that along with there being no rate increases in 2019, there will not be increases in 2020, and only one in 2021. 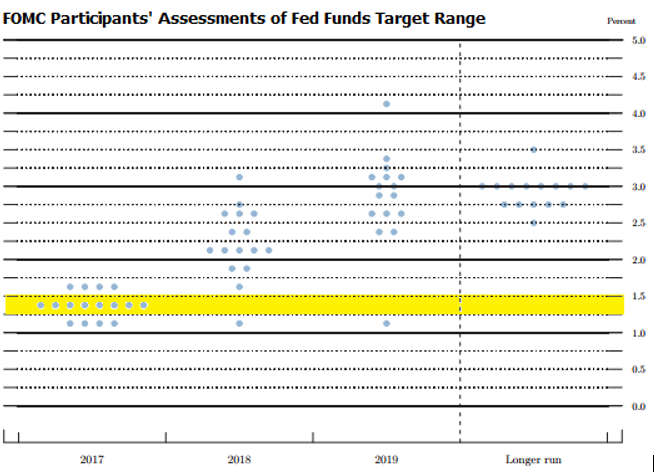 According to CNBC, the previous quarter’s dot plot from December only indicated that two members predicted no rate hikes, but the new dot plot indicates that 11 members switched. Last week, the Federal Reserve met for the first time in 2019. As predicted from their meeting back in December, rates remained unchanged and continue to hold at 2.25-2.5 percent after a unanimous vote from the central bank. In their statement, the central bank reports that more rate hikes are to be expected, but the committee will proceed with a more cautious approach moving forward as they closely monitor economic conditions. “In light of global economic and financial developments and muted inflation pressures, the Committee will be patient as it determines what future adjustments to the target range for the federal funds rate may be appropriate to support these outcomes," the statement said. Policymakers are considering adjusting balance sheet reductions in the bond portfolio, and report that they expect to operate with “an ample supply” of bank reserves. According to CNBC, all of this indicates that the balance sheet will remain sizable after the reductions are complete. The Federal Open Market Committee (FOMC) met at the end of the year to decide if they were going to raise rates one more time before closing out 2018. In addition, they discussed the forecasted economic conditions in 2019. The FOMC unanimously decided to raise the Fed funds rate for the fourth time in 2018 by 25 basis points from 2.25 to 2.5 percent, despite pressure by President Donald Trump to not raise rates. However, officials saw a rate hike necessary with a competitive job market, wage growth at 3.1 percent and inflation at 2 percent. The rate increase will help normalize interest rates and prevent prices from growing too fast. After the two-day meeting, policymakers announced they anticipate slowing rate increases in 2019. “Despite this robust economic backdrop and our expectation for healthy growth, we have seen developments that may signal some softening,” said Jerome Powell, Chair of the Federal Reserve. According to CNN, Powell said there were a number of “cross-currents emerging” which led most policymakers to lower their economic growth forecasts, and take a more moderate approach to raising rates throughout 2019. After examining the latest dot plot, pictured below, it is predicted that there will be two rate increases in 2019 – one less than previously announced. As everyone moves into 2019, banks and credit unions can take advantage of the rising rates to increase profits by lending more at a higher rate. Last week, the Federal Open Market Committee (FOMC) met to discuss the economic conditions for the rest of 2018 and make predictions for the next three years. Though expected, the biggest news to come out of the meeting is the third increase of the Fed funds rate this year. In a unanimous decision, the Fed raised the rate by 25 basis points from 2 to 2.25 percent. The new interest rate hike means that savers can look forward to seeing higher yields on CDs and money market accounts, while the cost of borrowing is going to rise since the prime rate also increased by 25 basis points to 5.25 percent. 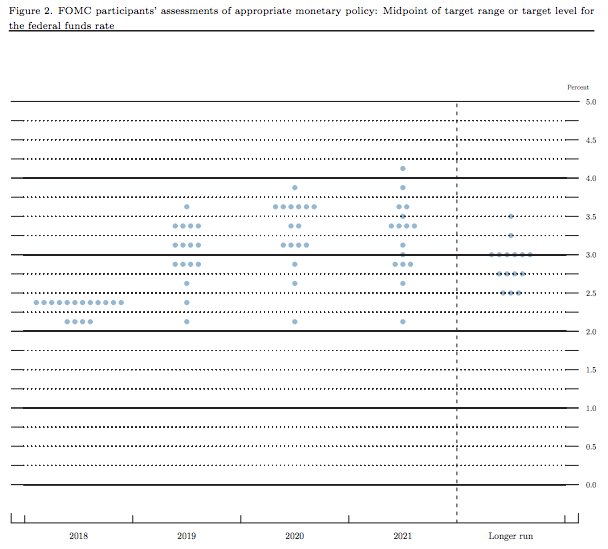 After reviewing the Fed’s latest dot plot, pictured below, experts predict the rate to increase once more in December 2018, three times in 2019 and potentially one time in 2020. According to BankRate, the low unemployment rate at 3.7 percent, the abundance of jobs, stable inflation (currently around 2 percent), and slow GDP growth indicates the economy is stable, so why would Fed officials continue to raise rates with no indication of slowing down? Analysts and industry experts alike are slightly confused about the idea of increasing the rates over the next few years because there does not seem to be a reason to do so. They report that this idea could mean that the central bank believes that rates are coming to a point where they’re neutral, and are no longer propping up the economy or slowing it down. During the meeting, the Fed reiterated the importance of trimming the balance sheet and said it will increase the monthly caps of its balance sheet shrinkage by $10 billion per month beginning this October. This addition brings the total monthly reduction of its balance sheet to $50 billion. Another change the Fed made during this month’s meeting is the interest rate on excess reserves (IOER). The Fed will now pay banks 2.2 percent on their reserves, up from 1.95 percent in June. Overall, the rise in the Fed funds rate will benefit banks and credit unions because they are able to lend out at a higher rate. Financial institutions will be looking forward to the next possible hike to take advantage of the rising rates to increase profits. 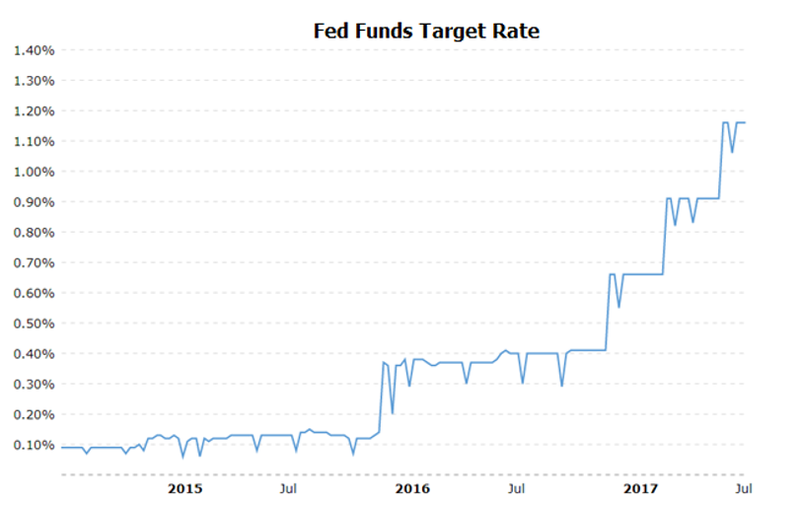 After holding the Fed Funds target rate near zero (0.00% – 0.25%) for seven years, the Federal Reserve raised its benchmark interest rate range by 25 basis points in December 2015 (see chart below) on signs of a strengthening U.S. and global economy. Next, the Fed waited until December 2016 to hike rates by another 25 basis points. At the time, the Fed signaled that there could be as many as three rate hikes in 2017 if the economy appeared strong. Then, on solid jobs numbers and falling U.S. unemployment, an emboldened Fed raised rates twice in quick succession - in March 2017 and June 2017 - by 25 basis points each. The Fed Funds rate now stands at 1.00% - 1.25% and Fed watchers are wondering if the third rate hike might come in September or December, or not at all. At its June 2017 meeting, eight of the nine Federal Open Market Committee (FOMC) members voted to raise the target range for Federal Funds to 1 to 1-1/4 percent citing continued labor market strength (with solid job gains and a dip in unemployment), and moderately rising economic activity (with a pickup in household spending and business investment) in recent months). Fed data also showed a slight drop in inflation which continued to remain below the Fed’s 2 percent target. A lone dissenter on the FOMC did not want a rate hike because of a steady drop in inflation to levels well below the Committee's 2% inflation objective. And he may be onto something… here’s why: annual 12-month inflation data from the Bureau of Labor Statistics points to a steady decline in the Consumer Price Index from 2.7% in February 2017, to 1.6% for the 12 months ended June 2017. In parallel, PCE inflation (a price index for personal consumption expenditures that’s closely watched by the Fed) also showed a similar drop, which most voting members chose to ignore in favor of positive economic data. Looking ahead, FOMC members expect moderate expansion in economic activity and strengthening labor market conditions which should allow for a gradual uptick in interest rates. Members expect inflation to stay a little below 2 percent in the near term, and to stabilize at about 2 percent over the medium term. While members expressed uncertainty about government policies (ACA repeal, tax reduction and other Trump initiatives), they saw no major threat to their economic outlook. Minutes released by the Fed from its June 2017 meeting state that the Fed expects economic conditions to “evolve in a manner that will warrant gradual increases in the federal funds rate.” In other words, barring unsettling economic data, the Fed plans to gradually increase interest rates. 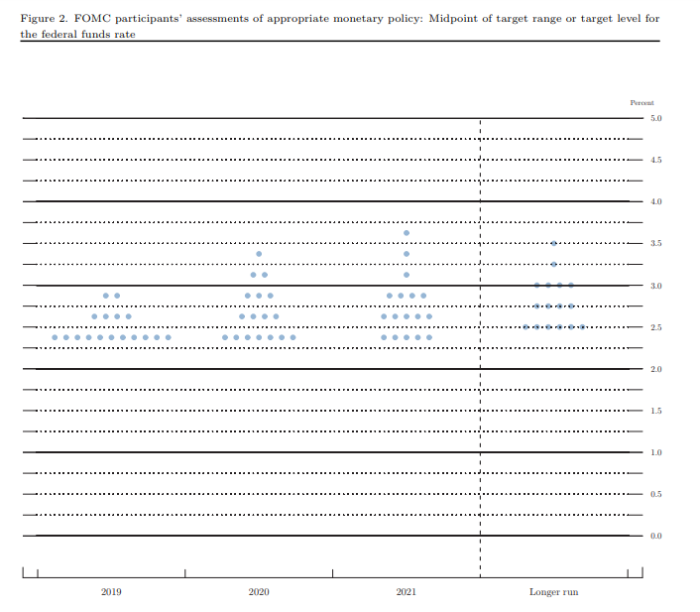 And the Fed’s Dot Plot (below) supports this, with most members expecting 2017 to end with a target rate of 1.25% - 1.50%. The assessment for 2017 shows four data points in the 1.50% – 1.75% range, eight in the 1.25% - 1.5% and four in the 1.00% - 1.25% range, with a strong overall bias towards a higher target rate when we exit 2017. 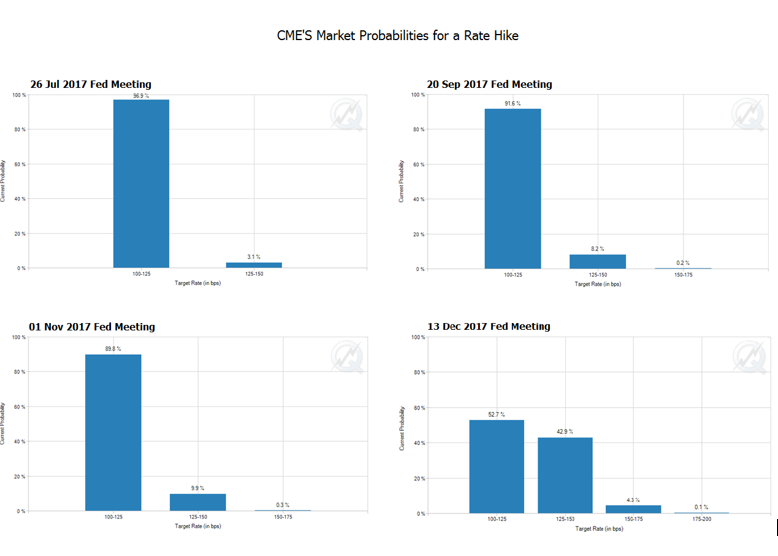 Moreover, the Chicago Mercantile Exchange’s FedWatch Tool, which shows market expectations for a rate hike at the Fed’s next four meetings in 2017 (see below), points to no hikes until the December 2017 FOMC, at which time markets foresee a 25 basis point increase with 43% probability (and, interestingly, a higher 53% probability of rates staying unchanged even at the December meeting). The Federal Reserve plans to start unwinding much of its $4.3 trillion balance sheet of Treasury and Agency securities (“normalization”) beginning in late 2017, and this is expected to put some upward pressure on interest rates. Essentially, the Fed plans to reduce its bond purchases, leaving more bonds in the market (more supply), which should lead to a dip in bond prices and a rise in interest rates (rates move in the opposite direction of bond prices). That worries bond managers who believe normalization could have unintended consequences; including a bond market crash (with a sharp drop in bond prices), which could spike rates upward and put the brakes on economic growth. The recent dip in inflation data and the Fed’s balance sheet normalization plans have also given a few other members pause. In July 2017, Federal Reserve Bank of Philadelphia President Patrick Harker said the Fed should wait for more inflation data and gauge market reaction to the winding down of its balance sheet before voting for another rate hike. In a nutshell, the markets expect the Fed to not raise rates until its December 2017 meeting, and that too with a 43% probability. Fed members themselves see the Fed Funds rate at 1.25%-1.50% at the end of the year, and they are the ones who get to vote on rates. 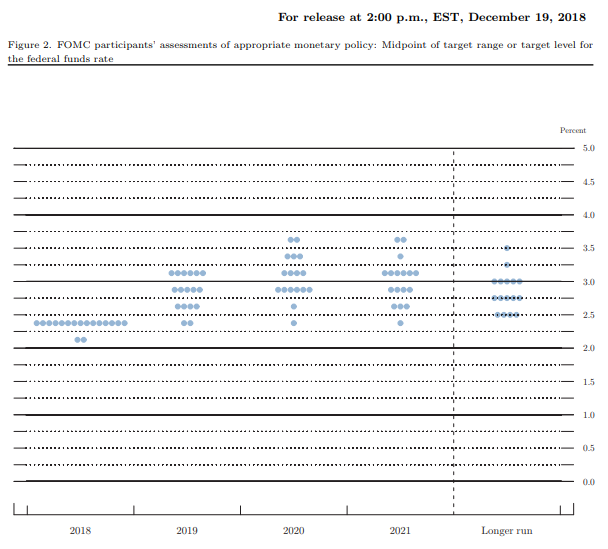 So, barring unexpected shocks, the Fed will likely increase its target rate at its December meeting. Expectations of a gradual rise in rates bodes well for banks, especially community banks and credit unions that have been operating on razor-thin margins over the past seven years of near-zero rates. With lower interest rates, holding excess cash wasn’t a major concern because the opportunity cost of carrying cash (revenue the bank was losing out on because this asset was not invested) was lower than the cost of delivery. However, with higher interest rates, the ‘cost of carry’ goes up; higher rates also offer financial institutions (FIs) the opportunity to earn higher returns on non-earning assets (cash), but banks are slow to pass on higher interest rates to customers on their savings or CD accounts; to capitalize on this arbitrage, FIs need to get efficient in tracking, managing, and deploying their non-earning assets. In addition, as rates rise, banks and credit unions should see a steady uptick in consumer deposits on increased demand for safe, interest-yielding instruments such as savings accounts and CDs. Moreover, despite solid jobs numbers and low unemployment, Americans have been hoarding money in checking accounts over the past few years because they continue to be concerned about the economy and their own job security. As a result, bank deposits were up 6.6% in 2016 to $10.7 trillion, their highest level since 2006, with the average checking account deposit up from $1,000 in 2007 to $3,600 in 2017… and the influx will only rise with rate hikes. While all this is good news for financial institutions, it increases the urgency of prudent management of non-earning assets so cash doesn’t languish, unused, in ATMs, branches and vaults, but is actively redirected into earning higher returns and boosting the financial institution’s profits as rates rise. So now is the time to start thinking about the next rate hike, to identify optimal cash levels and position your financial institution to capitalize on the next rate hike.